Pastor Chris Oyakhilome of The Healing School is an internationally acclaimed faith healer; a Christian missionary on a divine mission. His words and actions have miraculously healed the afflicted and his larger-than-life presence has filled a generation of Christians with hope through prayer. As the driving force and author of Rhapsody of Realities daily devotional, Pastor Chris Oyakhilome has been reaching greater numbers of people all over the world. The words of hope and salvation, as delivered by our Lord and Savior Jesus Christ are powerful messages interspersed with Pastor Chris’ ministering words. One of the pastors who has been profoundly influenced by Pastor Chris Oyakhilome is Pastor Merina Vinberg of New York. She has taken it upon herself to administer healing and comfort to the sick in the Big Apple. 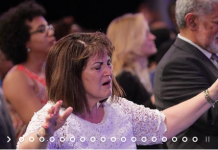 After visiting The Healing School with Pastor Chris Oyakhilome, Pastor Merina Vinberg returned to New York to put her faith-based prowess to the test. The Word of God is powerful and holds within it great healing abilities. It is this that Pastor Merina Vinberg brings with her to the sick at Nassau University Medical Center in New York. Pastor Merina has been ministering to the sickly on a regular basis. She shares her deep love and appreciation of our Lord with those in need of healing. Thanks to the Rhapsody of Realities devotional and Pastor Chris Oyakhilome, she brings her messages of comfort and love from the Lord direct to those in need in New York. Among others, Pastor Merina Vinberg shares insights on healthy living, direct from The Healing School Magazine. But the true miracle is evident in the Lord’s healing power, when she lays hands on the sick and commands the demons to depart. Hallelujah! Pastor Chris Oyakhilome’s Healing School Magazine is both inspirational and powerful. Staff and patients at the Nassau University Medical Center in New York were provided with copies of this periodical to share in the glory of our Lord Jesus Christ. Upon receiving The Healing School Magazine, people quickly realized that they had received Word from God. Healing was bestowed upon them instantly; praise God. Ministers from around the world will soon be visiting the Ministers’ Visitation Program in Johannesburg, South Africa. As Nesim Arian of Egypt says, ‘… I expect something remarkable and beautiful to happen to all of us at this program.’, and Pastor Merina Vinberg can certainly attest to that. The Healing School is inspired by our Lord Jesus Christ and His Healing Ministry, to offer healing and miracles to the sick and afflicted. It is a comprehensive initiative led by Pastor Chris Oyakhilome and his emissaries all over the world. This Christian prayer network features audio confessions, video channels, news and an online magazine to help bring the Word of God to everyone in need. It is available in multiple languages, and fully downloadable to mobile, tablet and PC devices. As a complimentary service to Christians, The Healing School Magazine offers incredible insights and faith-based services to all those in need of salvation and healing. Does your site have a contact page? I’m having a tough time locating it but, I’d like to shoot you an e-mail. I’ve got some creative ideas for your blog you might be interested in hearing. Either way, great blog and I look forward to seeing it improve over time. Hi! Thanks for the feedback, we truly appreciate it. To contact us further, please send an email to: info@pastorchrisliveusa.com. Looking forward to hearing from you! God bless. Thank you for your comment! Glad you are enjoying PastorChrisLiveUSA.org, thanks for visiting and God bless!! I precisely had to thank you so much once more. I’m not certain what I might have worked on in the absence of the methods revealed by you about such a field. It had become a very traumatic difficulty for me, but being able to see the very expert manner you handled the issue forced me to jump with happiness. I am just grateful for this advice and hope that you recognize what a powerful job you are undertaking educating the mediocre ones using your webblog. More than likely you have never encountered any of us. Thanks for each of your labor on this blog. My mother loves setting aside time for investigation and it’s easy to see why. A lot of people notice all of the powerful manner you offer invaluable items on the web site and even strongly encourage contribution from some others about this subject matter plus my simple princess is certainly starting to learn a great deal. Take pleasure in the rest of the new year. Your doing a fantastic job.